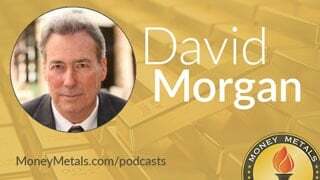 Later in today’s program we’ll hear from David Morgan of The Morgan Report and we highlight a very interesting set-up in the silver market that could lend itself to significantly higher prices. David also shares his thoughts on the price levels he wants to see before getting too excited -- and he updates us on the gold to silver ratio. So stick around for another great interview with David Morgan, coming up after this week’s market update. Gold and silver markets continue to be trapped between support and resistance levels. The precious metals treaded water through Thursday’s close, trading little changed on the week. As of this Friday recording, gold prices come in at $1,334 an ounce, up 0.6% on the week. Silver trades up 0.2% this week to $16.44 per ounce. Turning to the platinum and palladium markets, a more bearish picture took shape this week. Platinum posts a 2.1% weekly loss to come in at $916. The platinum to gold ratio has now broken down to an historic new low below 0.7 to 1. Platinum now represents one of the greatest relative value opportunities that’s ever existed in the metals space. But investors will have to be patient, as platinum has traded at a discount to gold for more than three years now. And it isn’t showing any signs of positive momentum at the moment. Meanwhile, palladium prices took a 5.0% hit this week to trade at $905 per ounce. Yes, it’s just below platinum now. Palladium has taken it on the chin so far in 2018 after posting stellar gains in 2017. The world’s supplies of the platinum group metals come largely from South Africa. Mining output there is set to shrink significantly in the months ahead. Leading South African platinum producer Anglo American Platinum has announced a freeze on new capital investment. Another South African major, Impala Platinum Holdings, is shutting down mining shafts and laying off workers to try to conserve cash amidst poor market conditions. South African miners also face growing political risk from the country’s socialist and increasingly rapacious government. Property rights and the rule of law are now under threat in South Africa, and that could further discourage companies from investing in mining operations there. The ruling African National Congress recently moved to begin confiscating white-owned farms without compensation. Speaking of confiscation, it was 85 years ago – April 5th, 1933 – that U.S. President Franklin Delano Roosevelt issued his infamous gold confiscation order. Private citizens were ordered to turn in their gold in exchange for dollars. The government then devalued the dollar, robbing citizens of their purchasing power. There are a lot of myths about gold confiscation that persist today. Many of them are pushed by numismatic coin peddlers to try to scare investors into buying heavily marked up specialty gold coin products. Numismatic promoters claim that these types of coins are specifically exempt from confiscation. The reality is that under our current fiat monetary system the government doesn’t need gold in order to expand the currency supply. The government would have no particular reason to nationalize gold. And if it ever did, we have no way of knowing whether it would exempt numismatics. In the case of high-premium numismatic coins that are touted as “confiscation proof,” the same supposed legal protection can be gained from American Eagle coins. Popular gold and silver Eagles are considered by law to be numismatic even though they sell at closer to bullion prices. At the end of the day, getting more metal for your dollars is a way better hedge against economic and political risk. During a crisis, you may need to sell or barter with portions of your precious metals stash. Graded coins and proof finishes are unlikely command any premium. The most widely recognized bullion products in the most common sizes will be the most liquid and useful. Practically speaking, the government won’t have any way of knowing how much gold you have, or in what form, or where it is stored – unless you disclose it yourself or own it through a bank or brokerage account. When the government ordered citizens to surrender their gold bullion bars and coins in exchange for cash in 1933, it relied on people to come forward and comply. Some did. Many didn’t. FDR’s Executive Order 6102 prohibiting the hoarding of gold bullion but didn’t authorize government agents to conduct random sweeps of home safes and bank vaults. Some safe-deposit boxes were seized as a result of bank failures, but door-to-door gold confiscations never actually happened. The most immediate and most serious confiscation threat investors need to be concerned about is the threat of their purchasing power being confiscated through inflation. Dollars are virtually guaranteed to lose value over time as the national debt grows ever larger and more unmanageable. Converting depreciating dollars into physical precious metals is one of the best ways to protect yourself from the confiscatory currency debasement to come. Well now, without further delay, let’s get right to this week’s exclusive interview with the man they call the Silver Guru. Mike Gleason: It is my privilege now to welcome in our good friend David Morgan of The Morgan Reports. David it's always a real pleasure to have you on and welcome back, how are you sir? Mike Gleason: There has been a fair bit of focus on the Commitment of Traders data lately, you cover that in this month's edition of The Morgan Report. Now on the surface the setup has looked quite bullish for silver with the bullion banks reducing their short position and speculators going net short for the first time in more than a decade. Given that the banks usually wind up winning against the speculators this looks like silver prices could be heading north, but you've been digging a little bit deeper into that data and there is some reason for pause, not everything in the report is bullish. We'd like to get your current assessment on the Commitment of Traders but first if you would explain a bit more about the COT, what it is because there are many listeners out there likely who may not be familiar with that report or how it can be used to forecast price moves. David Morgan: Certainly, the Commitment of Traders reports are produced for I think almost all the commodities. And it basically shows what the big money is doing versus the speculative money. And the big money in corn are the corn producers. The big money in wheat are the wheat producers. The big money in any commodity are basically, usually, the producers of the commodity. Now when you go to silver it's a little different because the commercials or the big money and commercials is how it's quantified in the Commitment of Traders report. So the commercial interests are those that have a commercial activity in wheat, rice, corn but in silver is it the miners that are the commercials and the answer is not really. The commercial interests are primarily the banks, which have the books of the big producers. So a big producer of silver would be a huge conglomerate like Rio Tinto or Broken Hill Properties, Billiton or some of the larger gold mines or some of the primary silver mines and they, the banks, will have the access to basically what their output is and it will do the quote-unquote hedging for these entities and they will trade for themselves in their own account and/or trade for their customers. So, the commercials in the silver industry are primarily the large bullion banks. And again, just to try to clarify that the bullion banks do a great deal of work with some of the larger producers of silver primarily on the base metal side, in other words these large conglomerates I just named. So, the other side are what's called trading funds or speculative funds, and these are commodity funds that the public can basically buy into and they buy a fund that trades commodities for them, they put up their money and they win, lose or draw based on how the commodity fund performs. There's also trading funds that are unique to family offices or hedge funds in particular so I can't categorize them all as being the same, but the Commitment of Traders reports puts all speculative trading funds in the same category and I think that's accurate. And the last category is basically the public, which holds very little as far as contract size, but they do definitely make up part of the speculative interest so to boil it down very simplistically you've got the commercial interests versus the speculative interests. Now the commercial interest wins almost every time and it depends on the commodity, but we're talking silver here, and physical demand is a very small percentage of what the paper interests show on any given day in the commodities exchanges. And this isn't just true of silver although silver is exceptional as far as the amount of difference between physical demand and the amount of paper behind it but all of them, you look at again the corn market, the wheat market, lumber market, cocoa, cotton it doesn't matter, whatever you look at the amount of actual physical commodity that comes off the exchange relative to the amount of paper that supports a contract is minuscule, usually in the one, two percent range. So that's not that unusual, you can't just point at silver and say "look they're only 1% whatever comes off the exchange versus all these paper contracts," it's also true in most commodities. Again, silver is a bit exceptional as there is such a huge difference between them. However, what happens is the price is set in the paper markets and as long as there is enough physical to cover the physical demand and so far with few exceptions there has been. So it goes like this, the game starts, silver gets washed out, the price gets taken down, smashed and a lot of these big smashes have been with massive amounts of selling. You'd only sell a massive amount in one click of the mouse so-to-speak, if you wanted the price to go down. If you really wanted to get your best price for something you'd sell it slowly over time and you'd slowly feed it into the market and see what the market could adsorb, but that's not done, particularly in the silver market, gold market as well and that is when these huge amounts of paper product are pushed onto the market, massively and instantaneously. And there's only one repercussion for that and that is massive price movement to the downside. Let's say that has just taken place, when that takes place the commercial interests have just won a great deal of money because they were short the market all the way up so once the smashing down takes place and the market stabilizes the open interest or the amount of layers in the market has substantially reduced, which means that it's gone from a number of like 200,000 open interest to 100,000 open interest. I'm just giving round numbers for the idea. And now once the market is down at the bottom, I say as I've stated many times, the game is ready to begin again, which mean that the trading funds that are habitually long versus the commercials that are habitually short – remember I was talking specifically silver now – the price starts to move up and if more contracts are bought by the trading funds and the speculative interests then more the other side of the contract is taken by the commercial interest so up goes the price up up, up, up and then it gets to basically a level where the open interest is increased from the 100,000 back to the 200,000 and the trading funds are basically out of money. They only have so much money to allocate to the silver market because they spread out between the agricultural markets, the financial markets, the softs and everything else and there's so much for the metals and they're out of money and of course the commercial banks basically know that and so then they pull another one of these selling massive amounts of silver on paper, there isn't anybody to match the orders with so the price drops until the orders match, which means it's usually falls just straight down and then the orders start to match and then you get this big washout again and the game starts over because the open interest goes again from 200,000 down to 100,000. Mike Gleason: Yeah so rinse and repeat. So with that said if you will give us the highlights on what recent COT reports have been showing, what looks like good news for silver prices and what if any flies are in the ointment? David Morgan: So what's happened now is that the setup for the silver market is probably the best I've seen for a very long time because the commercial interests are almost long, they are short a very few contracts, which is a setup for the game to begin over again and the speculative trading funds are very short to market and the markets at a low and so this looks like a great setup and many people have commented on this, I mean everybody… TF Metals / Craig Hemke, I think somebody from Sprott, almost everybody has commented on this and they're all correct, the facts are as I just outlined. One thing however that got written in The Morgan Report that has me concerned is that we're starting at a level where the open interest is extremely high. In almost all the cases I can think of over the last 20 years or so when we're in a condition like this that was highly favorable for the price of silver to move to the upside the trading funds have been washed out and taken advantage of and the open interest have come way back down from my 200,000 to 100,000. In this analogy and we're not there, we're more like at 200,000 at the bottom of the market, which means that gave me pause Mike and I thought well if everyone's thinking the same, no one’s thinking very much. So, I'm really not sure what it means, it could mean that any move up would cause the speculative funds to be very very much in a short squeeze because they don't have much money left to devote to silver and they have to buy back massively to prevent further losses, that's a possibility, which is extremely bullish. Or there could be something else going on here. I actually have an open position, I'm ready to do… I gave it to my paid members on the look over my shoulder service where I showed them the trades that I'm doing but I want the market to prove it to me. I'm not too interested in exactly how it gets there, of course I will be looking at how it got there meaning what the open interest looks like once it achieves this parameter that I've stated but until that happens I'm very willing to just watch the market. So, very interesting, I don't think anyone has an extremely good reason why we're at such a great setup for silver to move up higher with what I consider an alarming open interest but that's the state of affairs currently. Mike Gleason: Really good summary there and gives people an inside look at exactly how that works... and it does drive a lot of these markets, what those reports look like. Now switching gears here, recently the Chinese began trading oil futures denominated in yuan as well as paying for oil imports using their own currency rather than the U.S. dollar. The volume of yuan oil futures trading is already quite significant, it amounts to a Chinese assault on the decades old homogeny of the dollar in oil trading. If successful it will substantially weaken the dollars position as the worlds primary reserve currency. Now this comes at a time when Trump has imposed tariffs on Chinese steel and aluminum prompting officials there to retaliate. They’re now imposing tariffs on U.S. imports and other options may be that they escalate a trade war or wage a currency war by dumping U.S. dollars or U.S. treasuries. So, there were already plenty of reasons to fear for the future of the dollar but the outlook has suddenly gotten a lot worse it appears, what do you make of these recent events? Is king dollar in true peril from China or are these fears overblown David? David Morgan: Well, I'm more inclined at my age and watching these markets for years to be of the idea that by the rumor sell the news. I think that the consequences of moving oil into the yuan is extremely significant over time, but I think a lot of people are jumping up and down shouting and screaming at this point in time because of that fact are missing the longer-term view, which means that I don't see any real repercussions taking place immediately. I think over a longer period of time it certainly will and I think it's meaningful. I think it's a substantial shift in the perception of the dollar but again I think what's being made of it primarily in the financial press and particularly internet news media or alternative news. It's overblown at this point in time. So, the dollar isn't doomed, the dollar will continue to weaken and there obvious aren't as many dollars required to purchase oil and there's not a situation like we saw with Saddam Hussein or Gaddafi or these others that have tried to circumvent using the oil market and being paid only in dollars, you're not going to see any of those repercussions happen to China. However, again, I don't think it's going to be a significant short term as most people are indicating. Mike Gleason: The precious metals markets are performing well on a relative basis, stocks have recently seen some heavy selling, bond prices have been falling as markets finally grapple with the idea of higher interest rates. And the dollar, which has been in decline for more than a year looks like it could be headed lower still as we just discussed. There have actually been some healthy gains in metals prices so far this year yet the sentiment surrounding gold and silver David remains near rock bottom. These markets need some sort of a catalyst either some fear or greed to drive demand and interest in the sector. As you look over the months ahead do you expect these markets will find that catalyst or do metals investors just need to plan on hanging on there for a while longer? David Morgan: Well it’s difficult to answer. The facts are that gold is the most negatively correlated asset to the stock market, and I've already said on several shows like this that I believe strongly that the top is in for the equity markets, probably the bond market as well, which means that gold will have its day in the sun over time. I also think because I said about the yuan trade for oil that this might be more of a stealth market where we don't see… that could be the catalyst in other words the catalyst has already occurred, which means long term the stock market is going down, long term the gold market is going up. But it could take place in such an insignificant manner as far as meaning it stays up where golds up five and then it's off three and then it's up six and it's off two and where it just kind of grinds up is how I like to frame it. So, it's moving up but not in such a significant way where anybody outside of the gold bugs are actually paying any attention. Then all of a sudden we're at $1,450 roughly $100 higher than we are today while doing the interview and then we get what I call the my-mys which means more people that pay some attention to the financial markets go "my-my golds up to $1,450, I dint know that, last time I paid any attention to it, it said $1,350," so that's a possibility. Is that exactly what's going to happen? I don't know but the catalyst I think is actually there and there could be other catalysts. I'd be remiss to say that more war drums, more problems in the Middle East, more problems with the European banks, if Deutsche Bank comes to the fore again. Something significant with the trade war that's reportedly going on, certainly tensions are increasing so there's so many and I'm almost tired of saying that black swans flying around out there that certainly any catalyst could take place at any time. I could name several more, but I think it's immaterial of this discussion because the main catalyst is that the dollar continues to slide and the equity market and bond market for the U.S. dollar continues to slide. And everyone is basically trying… I shouldn’t say everyone… major entities such as nation states are trying to move out of dollar denominated assets on a basis that's significant, which means the Asia Infrastructure Investment Bank, China going to resettlement in oil, which we just discussed. So these are major major means to acquire assets that don't require the U.S. dollar and this is another catalyst that's taking place, has taken place and continues to take place. So, I think the idea for me is that we have to be patient here on a gold market, I really want to see gold break the $1,350 level, I want to see it stay there on good volume and I want it to see it start working its way higher. Once that's accomplished then I really demand to see silver start to catch up to gold. The gold to silver ratio has been very very high up to the 82 level and I like the gold silver ratio similar to the Dow Theory, which means that industrials have to be supported by the transportation index and this is what I think about the metals markets. Once gold starts its move and I say $1,350 is a good round number, I want to see silver start to move up to $17.50 or whatever and I want to see that ratio start to move down from 82 to 80 and I want to see it get below 72. I would be extremely satisfied that the market, not me, but the market has told us that we're up and away. Once we see gold above $1,350 we see the gold silver ratio below 72. That's what I looking for, until then I'm building cash, I'm sticking with the main investments that we’ve outlined in The Morgan Report, we just sold off two, actually one was bought out by Hecla and the other one was a zinc-silver play that we had early on, we made some good money on that, we sold it to free up some cash. And I’m basically telling our members just to hold onto cash for a while, let’s see what happens and Let's not get impatient. Mike Gleason: Well, as we begin to wrap up here David give us your thoughts on the events you'll be watching most closely in the months ahead when it comes to the metals markets. And then also maybe do you have any advice for the beleaguered metals investor who's wondering when his day will finally come, anything on the mining industry, just your closing thoughts here or anything else that we haven't covered that you want to hit on before we leave. David Morgan: Well, I've already hit on it, what I’ll be watching the most closely is how this setup and the COT for silver unfolds because it's at a very extreme condition and all of us kind of are on the same side of the boat like I said before, everyone's thinking the same, no one’s thinking very much. So, I want to watch that and see what takes place, I want to see how the open interest comes down and so that's number one. Number two is of course the dollar and the global political events, anything that takes place that changes in the trading of the metals, in other words if we start seeing a change in patterns on what the commercials are willing to do, either gold silver or both, I think that's significant. And overall sentiment, I want to see the miners start to get, catch a bid. I think if I am correct and we'll see in the exchanges a major shift from equities into gold – and it certainly looks that way – I want to see that proven to me by the market as I just outlined. So, I haven't really had much to add Mike I just think it's good to review those things. I think it’s better to be solid on the fundamentals and what are the most important cases to look at rather than try to pull something out of the air and say, “oh, I’m looking at this” because I'm really not. Mike Gleason: Yeah well put, I think it’s always good to check your premises at times like this, and we've said before, but it does feel like the calm before the storm. Well outstanding insights as usual David, we always appreciate having you on and getting your thoughts on these important matters. Now before we let you go please tell people how they can learn more about The Morgan Report and then what it is that they'll get if they do sign up and become a member. David Morgan: Well the easiest thing to do is go to TheMorganReport.com and just put in a name and an email, you'll be asked to verify that it's you and you're not a robot and then you'll be on. And in that weekly update I do every weekend I do a weekly perspective that's for you, I also give you some of our Twitter feeds, the podcast, what I do on YouTube and all that's for you. I also usually answer a question every month or so that someone has sent in and asked me about, for example what do I think about the gold to silver ratio at this point in time? Does it have meaning or not? That type of thing, for those that are so inclined, that really want to make money in the resource sector – and oh by the way when you sign up for the free report you'll be given a free report called Riches and Resources that outlines why we are still bullish on the resource sector. This is stuff that's needed not wanted, in other words commodities are the basic building blocks of everything, everything that you can't grow and of course some commodities are food, anyway I digress. The Morgan Report basically goes throughout the top-tier, the mid-tier in a speculative sector and we've been having extremely great success in the speculative portfolio the last several months. We have a technology stock that's basically going to disrupt not only the mining sector but also the electronic waste sector and this stock is up from the 40 cent level up to as high as two bucks already, it's drifted back to about $1.60. Some of our mastermind members were able to acquire the stock at 25 cents, that's a long term hold I think it's going to go far higher than it is currently so what I wanted to point out Mike, and thanks for allowing me the time, is that we look at all the resource sector and really what we've been having the best success with right now is basically technological breakthroughs in the mining sector that will be significant over time. Secondly, I'm going to be doing a mastermind series this month on another potential technology breakthrough using AI, artificial intelligence in the mining sector. So, that will be for our top tier mastermind group and they'll hear it first from the CEO and I'm not sure if there is a financing opportunity available on that particular company or not, but we'll learn that straight from the horse’s mouths. So, that's it… it’s for serious investors but it's not just silver, silvers part of it but gold, the base metals, rare earth elements, energy metals and everything else but we cover again the gambit and we've had great success making money even during this down period. And if I go back to gold and silver, there are certain companies that have a business model that makes money regardless of what the price movement is in the silver and gold markets and some people are astounding to learn that but you go to our top-tier section, we have companies that are up 600% at this point in time Mike, because again these companies make money regardless of what the cash price is for the, for gold as an example. Mike Gleason: Yeah if you're going to be in this market, the mining sector and so forth, all these other resource types of investments, somebody like David is about the best you can possibly follow, his track record is truly fantastic and there's a lot of stuff in The Morgan Report, we definitely urge people to check that out. Well David thanks so much again, appreciate catching up, we'll have to do it again soon and hope you have a great weekend, thanks very much. David Morgan: My pleasure, thank you Mike. Mike Gleason: Well, that will do it for this week. Thanks again to David Morgan, publisher of The Morgan Report. To follow David, just go to TheMorganReport.com. We urge everyone to, at the very least, go ahead and sign up for the free email list and start getting some of his great commentary on a regular basis. And, if you haven't already, be sure to check out either The Silver Manifesto or Second Chance: How to Make and Keep Big Money During the Coming Gold and Silver Shock Wave, two great books, both of which are available at MoneyMetals.com and other places where books are sold. Be sure to check those out.